Despite all indications to the contrary, I am in fact still alive. Things have been quiet on here because I've been spending the last two months recovering from the Wildflower Triathlon and writing my thesis, so not much to blog about other than writing about how I'm writing about my thesis, which would be a little meta. As a quick sanity break, I went back to playing with my apartment's time network, which I've already shown how to configure multicast discovery on. Now that all of my NTP clients can automatically discover my NTP servers, even across subnets due to my apartment's network supporting multicast routing, the next logical step is to improve the actual NTP servers. This third option is one of the more reasonable solutions to an entirely unreasonable problem, so I decided to go with that as a first pass. I long ago somehow ended up with a Motorolla OnCore GPS engine that was missing it's antenna. Luckily, MCX active GPS antennas can be had on eBay for <$10, so once that problem was solved I could play with an ancient industrial-grade GPS receiver. This thing not only supports the standard TTL NEMA sentences that tell you where you are and what time it is, but also has a one pulse per second output and supports feeding in differential GPS corrections for a fixed "time-keeping" mode. As a quick first test, I built a quick adapter board between the GPS engine's 2x5 pin header to the standard FTDI serial cable, with a diode and 0.3F capacitor (Yes, not micro Farads, 0.3 actual Farads) to keep the SRAM from losing the current GPS almanac every time I power cycle it (which cuts the GPS lock time down from 12.5 minutes to 20-30 seconds). The 1pps output from the received is connected to the CTS line on the FTDI cable. Configuring GPSd is ridiculously simple: Tell it which serial port you have your GPS receiver connected to, and it figures out baud rate, which pin you have 1pps connected to, etc. Then just point your NTP server at two special local host addresses where GPSd makes the time information available. The NMEA sentences are off by 200ms due to the delay through the serial port, so I'm thinking I might tag it as a strata 8 source or something so that it avoids using something that confuses the NTP algorithm that much. 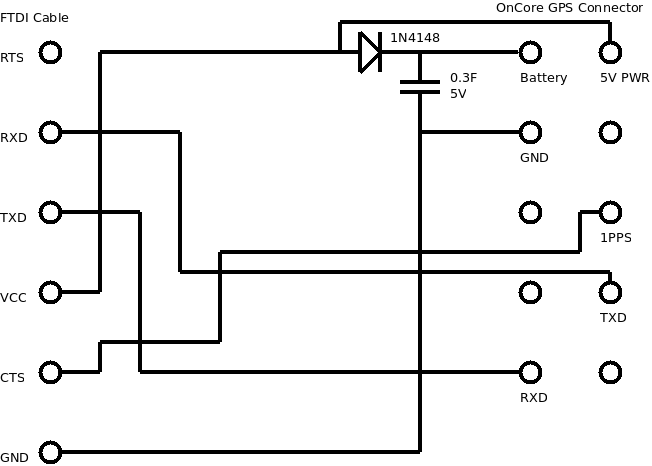 Reading 1pps over USB isn't ideal, and is likely the source of most of my clock jitter. Initial measurements are putting my clock jitter around the 0.1ms range, but I really haven't gotten a chance to do too much analysis of it. Ideally, I'd use an actual hardware serial port, but I need to build the RS-232 translators first... My new router I'm building has four hardware serial ports, so I won't have any excuse. 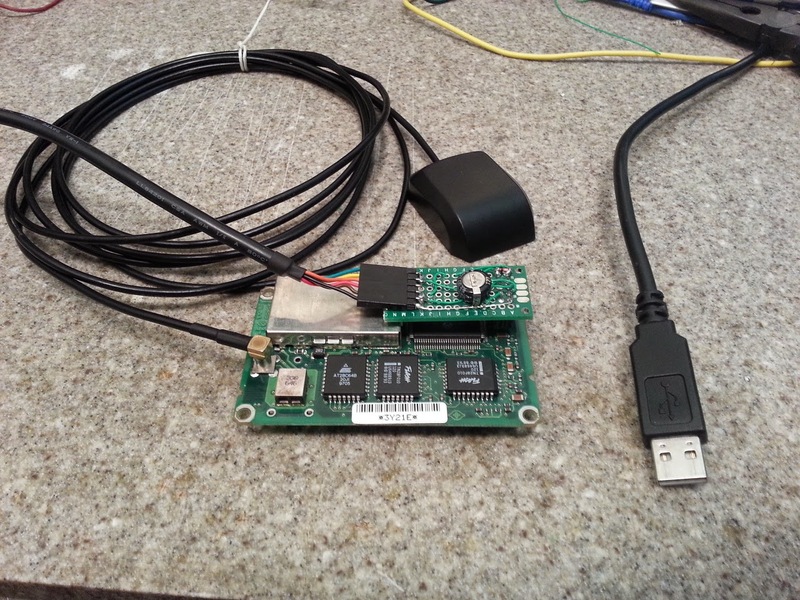 I have build a usb gps receiver also. Scroll down for analysis of the 1pps signal over USB. Most of the time there is low jitter, sometimes it spikes.